Gonzo’s Quest is one of the most promoted video slots from Net Entertainment. It’s likely to see a lot of casino free spin offers promoted on this slot machine. The theme in this slot machine is the search for the old mythical South American Gold City of Eldorado that the Spanish conquistadores searched for in Peru during the in the 16th century. Gonzo’s Quest is a 5 reeler with 20 pay lines to bet on. You can strike the riches of Peru by winning the free fall feature where you are rewarded with 10 free spins with an increasing multiplier. Gonzo’s Quest offers a very exciting and entertaining slot machine. The theme has a very comic core in it since the characters and the symbols are very fun to watch. There is an avalanche feature in this slot machine where winning symbols vanish and are replaced by new ones and a possibility to win even more. The avalanche multiplier increases up to 5 times the normal pay out, if you’re lucky enough. 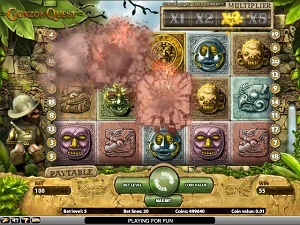 The graphics are great in this slot machine from Net Entertainment. As always, they deliver the highest quality in terms of design and effects. The sound is very suiting for the Conquistadores theme. In background, you will hear the jungle sound which is very effect full. There are also sound effects added to certain winning combinations. There are also a lot of animated effects that appear “outside” the reels. Gonzo the Conquistador is dancing and moves very funny the more you are winning. The overall impression is a great slot that has a very fun and exciting theme. The symbols in the main game are all in relation to the theme. The symbols are stone blocks of old South American Indian symbols. The wild is the symbol with the big question mark on it and it will substitute for all other symbols except for the free fall symbol. The free fall symbol will activate the free fall feature if you manage to hit 3 or more of it. The free fall symbols must appear in succession, starting from the leftmost reel. The free fall feature is triggered by hitting at least 3 free fall symbols in succession from the leftmost reel. This will give you 10 free falls (free spins) with an increasing multiplier which starts from X2. The more you win - the higher increase of the multiplier. You can also win additional free falls while playing the feature. The free fall feature has a lot of great visual effects to it. The Gonzo character will start dancing and move about, outside the reel, in a very entertaining way. This adds to a very fun gaming experience. Gonzo’s Quest has 5 reels and 20 pay lines for you to bet on. The minimum bet per line is 0.01 coins while the highest bet per line is 0.50 coins. Gonzo’s Quest also has an auto play function that you activate by clicking on the auto button in the lower left part of the gaming window.